Mungo Park (September 11, 1771 – 1806) was a Scottish explorer of the African continent. Park was born in Selkirkshire at Foulshiels on the Yarrow, near Selkirk on a tenant farm which his father rented from the Duke of Buccleuch. He was the seventh in a family of thirteen. Although tenant farmers, the Parks were relatively well-off - they were able to pay for Park to have a good education, and Park's father died leaving property valued at £3,000. The Parks were Dissenters, and Park was brought up in the Calvinist tradition. My hope is now approaching to a certainty. If I be deceived, may God alone put me right, for I would rather die in the delusion than wake to all the joys of earth. may the Holy Spirit dwell in your heart, my dear friend, and if I ever see my native land again, my I rather see the green sod on your grave than see you anything but a Christian. On his return in 1793, Park gave a lecture describing eight new Sumatran fishes to the Linnaean Society. He also presented various rare Sumatran plants to Banks. In 1794 Park offered his services to the African Association, then looking out for a successor to Major Daniel Houghton, who had been sent out in 1790 to discover the course of the Niger and had died in the Sahara. Supported by Sir Joseph Banks, Park was selected. On June 21, 1795 he reached the Gambia River and ascended the river 200 miles to a British trading station named Pisania. On December 2, accompanied by two local guides, he started for the unknown interior. He chose the route crossing the upper Senegal basin and through the semi-desert region of Kaarta. The journey was full of difficulties, and at Ludamar he was imprisoned by a Moorish chief for four months. He escaped, alone and with nothing save his horse and a pocket compass, on July 1 1796, and on the 21st of the same month reached the long-sought Niger at Segu, being the first European to do so. He followed the river downstream 80 miles to Silla, where he was obliged to turn back, lacking the resources to go further. On his return journey, begun on July 30, he took a route more to the south than that originally followed, keeping close to the Niger as far as Bamako, thus tracing its course for some 300 miles. At Kamalia he fell ill, and owed his life to the kindness of a man in whose house he lived for seven months. Eventually he reached Pisania again on June 10, 1797, returning to Scotland by way of America on December 22. He had been thought dead, and his return home with the news of the discovery of the Niger evoked great public enthusiasm. An account of his journey was drawn up for the African Association by Bryan Edwards, and his own detailed narrative appeared in 1799 (Travels in the Interior of Africa). It was extremely popular, has remained in print ever since and is also available in Project Gutenberg. Settling at Foulshiels, in August 1799 Park married Allison, daughter of his old master, Thomas Anderson. Two offers made to him to go to New South Wales in some official capacity came to nothing, and in October 1801 Park moved to Peebles, where he practised as a doctor. In the autumn of 1803 he was invited by the government to lead another expedition to the Niger. Park, who chafed at the hardness and monotony of life at Peebles, accepted the offer, but the expedition was delayed. Part of the waiting time was occupied perfecting his Arabic - his teacher being Sidi Ambak Bubi, a native of Mogador, whose behaviour both amused and alarmed the people of Peebles. In May 1804 Park went back to Foulshiels, where he made the acquaintance of Sir Walter Scott, then living near by at Ashesteil, with whom he soon became friendly. In September he was summoned to London to leave on the new expedition; he left Scott with the hopeful proverb on his lips, "Freits (omens) follow those that look to them." Park had at that time adopted the theory that the Niger and the Congo were one, and in a memorandum drawn up before he left Britain he wrote: "My hopes of returning by the Congo are not altogether fanciful." He sailed from Portsmouth for The Gambia on January 31, 1805, having been given a captain's commission as head of the government expedition. Alexander Anderson, his brother-in-law, was second in command, and on him was bestowed a lieutenancy. George Scott, a fellow Borderer, was draughtsman, and the party included four or five artificers. At Goree (then in British occupation) Park was joined by Lieutenant Martyn, R.A., thirty-five privates and two seamen. The expedition did not reach the Niger until the middle of August, when only eleven Europeans were left alive; the rest had succumbed to fever or dysentery. From Bamako the journey to Segu was made by canoe. Having received permission from the local ruler to proceed, at Sansandig, a little below Segu, Park made ready for his journey down the still unknown part of the river. Park, helped by one soldier, the only one left capable of work, converted two canoes into one tolerably good boat, 40 ft. long and 6 ft. broad. This he christened H.M. schooner "Joliba" (the native name for the Niger), and in it, with the surviving members of his party, he set sail down stream on November 19. At Sansandigr on October 28, Anderson died, and in him Park lost the only member of the party - except Scott, already dead - "who had been of real use". Those who embarked in the "Joliba" were Park, Martyn, three European soldiers (one mad), a guide and three slaves. Before his departure Park gave to Isaaco, a Mandingo guide who had been with him thus far, letters to take back to The Gambia for transmission to Britain. The spirit with which Park began the final stage of his enterprise is well illustrated by his letter to the head of the Colonial Office: "I shall," he wrote, "set sail for the east with the fixed resolution to discover the termination of the Niger or perish in the attempt though all the Europeans who are with me should die, and though I were myself half dead, I would still persevere, and if I could not succeed in the object of my journey, I would at least die on the Niger." To his wife he wrote stating his intention not to stop nor land anywhere till he reached the coast, where he expected to arrive about the end of January 1806. These were the last communications received from Park, and nothing more was heard of the party until reports of disaster reached the settlements on The Gambia. At length the British government engaged Isaaco to go to the Niger to ascertain the fate of the explorer. At Sansandig Isaaco found the guide who had gone down stream with Park, and the substantial accuracy of the story he told was later confirmed by the investigations of Hugh Clapperton and Richard Lander. This guide (Amadi) stated that Park's canoe descended the river to Yauri, where he (the guide) landed. In this long journey of about 1,000 miles Park, who had plenty of provisions, stuck to his resolution of keeping aloof from the natives. Below Jenné, came Timbuktu, and at various other places the natives came out in canoes and attacked his boat. These attacks were all repulsed, Park and his party having plenty of firearms and ammunition and the natives having none. The boat also escaped the many perils attendant on the navigation of an unknown stream strewn with many rapids - Park had built the "Joliba" so that it drew only a foot of water. But at the Bussa rapids, not far below Yauri, the boat struck on a rock and remained fast. On the bank were gathered hostile natives, who attacked the party with bow and arrow and throwing spears. Their position being untenable, Park, Martyn, and the two soldiers who still survived, sprang into the river and were drowned. The sole survivor was one of the slaves, from whom was obtained the story of the final scene. Isaaco, and later Lander, obtained some of Park's effects, but his journal was never recovered. 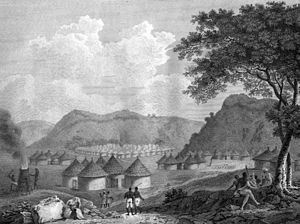 In 1827 his second son, Thomas, landed on the Guinea coast, intending to make his way to Bussa, where he thought his father might be detained a prisoner, but after penetrating some little distance inland he died of fever. Park's widow Allison died in 1840. J Thomson's Mungo Park and the Niger (London, 1890) contains the best critical estimate of the explorer and his work. See also the Life (by Wishaw) prefixed to Journal of a Mission into the Interior of Africa in 1805 (London, 1815); H. B., Life of Mungo Park (Edinburgh, 1835); and an interesting passage in Lockhart's Life of Sir Walter Scott, vol. ii. One of Park's direct descendants is the Canadian author (of Scottish lineage), Professor Andrew Price-Smith, who has published extensively on health and development issues in Southern Africa. Park, Mungo (1816). Travels in the Interior Districts of Africa: Performed in the Years 1795, 1796, and 1797 . London: John Murray. The Royal Scottish Geographical Society award the Mungo Park Medal annually in Park's honour.